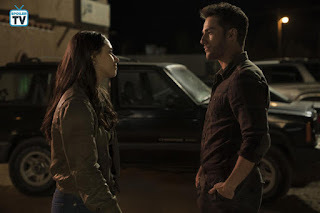 In this first episode of Roswell, New Mexico we see Liz coming home and seeing Max again for the first time in years. Max is an alien and saves Liz’ life when she is shot at the diner. A handprint shows up on her body, they grow close and Max tells her the truth about who he is. Isobel and Michael don’t like this. Isobel is forced to keep her secret from her husband. Alex also comes home and shares some intense moments with Michael. Kyle is suspicious of the mark he saw on Liz and is filled in on the alien presence in Roswell. New faces: When I first signed on to review this show I wanted to objectively judge it without letting the original show be a factor. 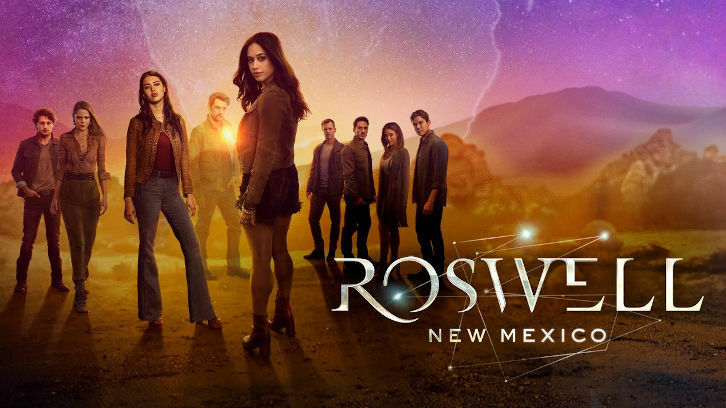 But let’s face it, there’s no ignoring the original Roswell show. The character are all the same, or are they? The leads of this show aren’t teenagers but adults. Liz is the daughter of undocumented immigrants who everyone hates because her sister killed 2 people while driving high. Max is a police officer, Isobel is married and .. well Michael is still a prick, but gay or at least bi (yay for rep). Alex is in the army and has lost a leg. Kyle is a doctor. We only got a glimpse of Maria, so far we only really saw her read people’s fortunes. I like that this show chose to tell the story with adults rather than teenagers. The school stuff would end up getting ignored anyway and I don’t think I could handle another show with people in their late twenties portraying teenagers (which is what the CW always does). Slow down: While this first episode gave us the intro to the alien storylines, it also gave us a lot of romance. In my opinion, too much romance. We all know that Liz and Max will end up together, so why are the writers pushing it so much. Let us get to know the characters first, build up the tension. I personally find slow burn relationships to be the best ones. Whenever I watch a show that instantly shoves 2 characters together, I never end up shipping it. Michael and Alex, on the other hand, have this love/hate relationship going on that I am totally digging. Now that is the human/alien relationship that has my interest. Nice changes: So aside from the changes to the characters, there are some new elements that have been added. Current events seem to play a large part in the show. The undocumented status of Liz’ dad will undoubtedly come up in the future. The show isn’t shying away from addressing racism and the comparison with the aliens is evident. If they would do these horrible things to their own people, what would they do to those of a different planet? I think the show definitely needs these heavy storylines to balance out the romance stuff. Please don’t be a bad guy: While it took me a moment to warm up to the original Kyle, I really like this new version. But I really hope he doesn’t get caught up in the alien hunt, though it certainly seems like he will. It’s such a cliché, “ex-boyfriend gets tangled up in the hunt for the new boyfriend because he doesn’t have his facts straight”. Can we just skip to the part where he figures out he’s on the wrong side and starts helping out the aliens?